The largest buyers as a class in 2017, as in 2016, were the public MOB REITs (HTA, DOC, HR), propelled by the $2.7B Duke Realty sale. These pure-play medical office REITs were the most competitive buyers of high value, health system-aligned properties through the first eight months of 2017 as their share prices were rewarded by their focused strategy on medical office, the most highly-prized segment of healthcare in 2017. HTA was the most prolific in 2017 with total investments of $2.7B followed by an impressive $1.4B by Physicians Realty Trust. Together, the two REITs accounted for a staggering 39% of MOB sales in 2017 in a year where a record $10.4B traded hands. Private buyers came on strong in the last 4 months of 2017 as public REIT share values swooned as a result of the rise in the 10-year Treasury yield. Total investments by private groups and institutional managers was a record $3.3B, reflecting robust dry powder ready to pounce when the opportunity arose. Harrison Street led the pack with an impressive $1.4B in MOB investment. New institutional capital helped to outbid the public REITs in the second half, as the medical office sector attracted new investors in light of peak pricing in other property sectors juxtaposed against the durable qualities of the medical office segment of healthcare and superior returns. 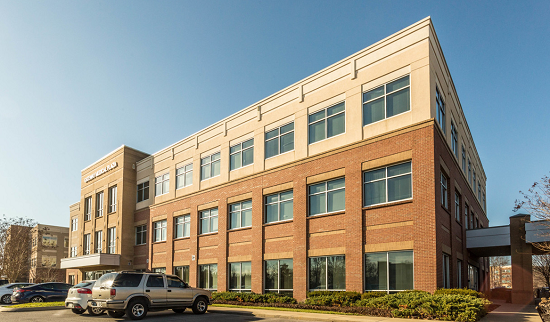 The Big Three diversified healthcare REITs (HCP, VTR, WELL) were buyers of medical office, but weaker share prices sidelined the group from acquiring the priciest medical office investment opportunities. With major holdings in seniors housing and skilled nursing with challenging operational issues in 2017, buying power for this group was limited to properties that offered strategic fits in markets and/or upside for accretive investments. In the short run, expect the Big Three to be preoccupied with managing their current holdings to position themselves for future growth. 2017 continued the pattern of lower fund raising for non-listed healthcare REITs following the peak years of 2013 to 2015 and modestly low levels of new investment. Small cap public healthcare REITs investing in medical office grew in number, but total investments given a relative high cost of capital was modest. A major trend in 2017 was the growing concentration of top buyers. Three buyers – HTA, DOC and Harrison Street – astonishingly, acquired more than half of the 2017 transaction value (52%). The top investors in this survey as a group bought 81% of all properties sold in 2017, following what were considered already highly concentrated years with 68% in 2016 and 54% in 2015. This trend towards consolidation of the buyer pool reflects a maturing of the key investors and their expertise in this specialty area. While 2017 was a record sales year overall for medical office, we remind our readers that 83% of the inventory remains owned by hospitals and physician providers. 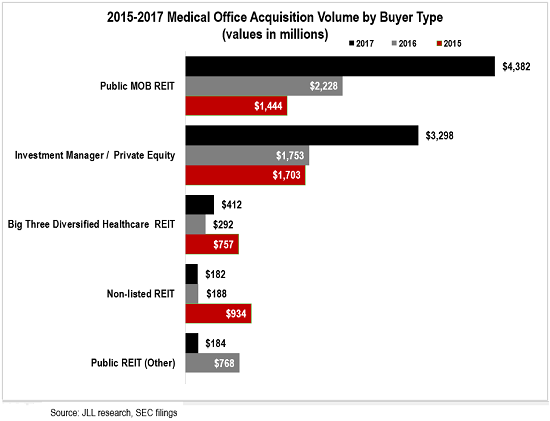 While market forces created liquidity by motivating investor owners to sell amidst record high level pricing, new supply will be needed in the long term via new development or monetization to satisfy a growing pool of medical office investors.